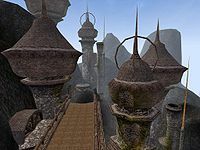 Bthungthumz, also known as Ald Carac, is a Dwemer ruin located in the northwestern section of Vvardenfell. They served as Dwarven fortifications that date to the War of the First Council, early in the First Era. In the Second Era, there was evidence that it was a massive processing facility for Dwarven Centurions and colossi, but it had fallen into great disrepair, with lava flowing into the ruins and the railing system that transported the automatons falling apart. It was repurposed to be used as a battleground for blood sport between the teams of the Pit Daemons, the Fire Drakes, and the Storm Lords. 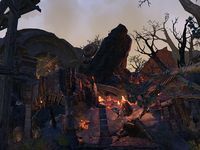 In the Third Era, an adventurer was tasked by House Telvanni with retrieving the ring of Dahrk Mezalf, a dwarven spectre that was said to have worked as a smith under the great Dwemer inventor Kagrenac. This page was last modified on 19 January 2019, at 16:52.